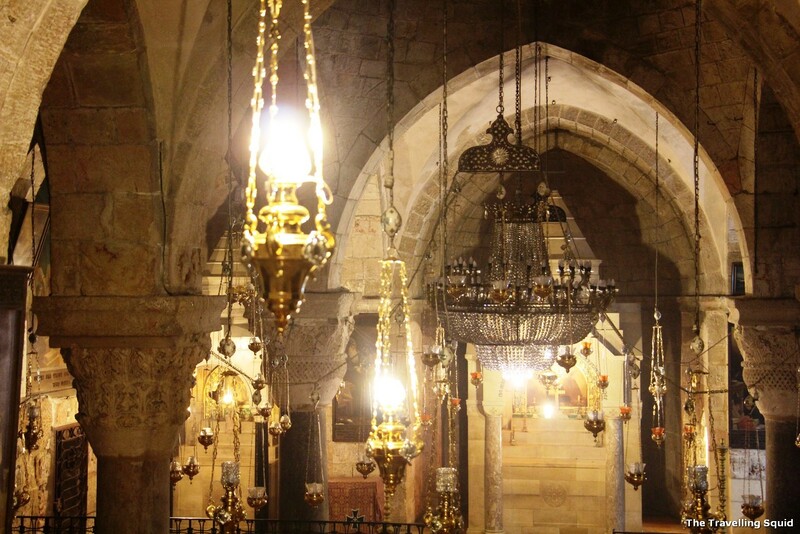 Church of the Holy Sepulchre in Jerusalem – a building steeped in history. 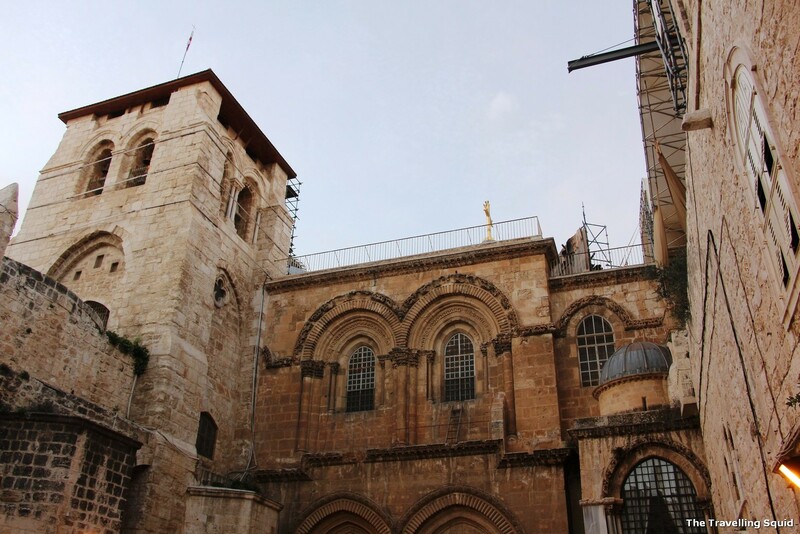 The Church of the Holy Sepulchre in Jerusalem is one of the key sights in the old city of Jerusalem. 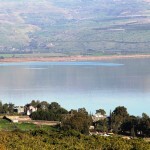 It is a church of great historical significance, dating back to the fourth century, according to Wikipedia. 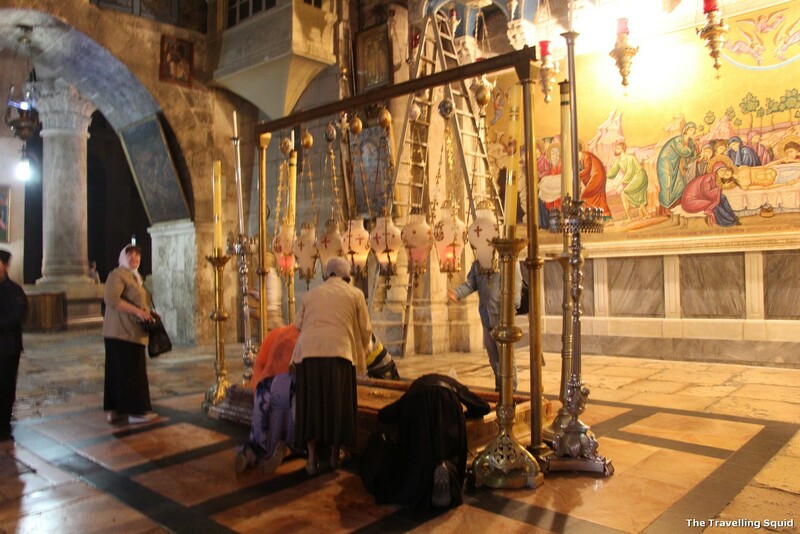 It is home to the two holiest sites in Christendom: the site where Jesus of Nazareth was crucified, known as “Calvary” (Calvāria) in Latin and Jesus’s empty tomb, where he is said to have been buried and resurrected. 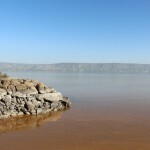 We had arrived closed to the closing time, and I decided to join the queue, just to take a look at the site of Jesus’ resurrection. 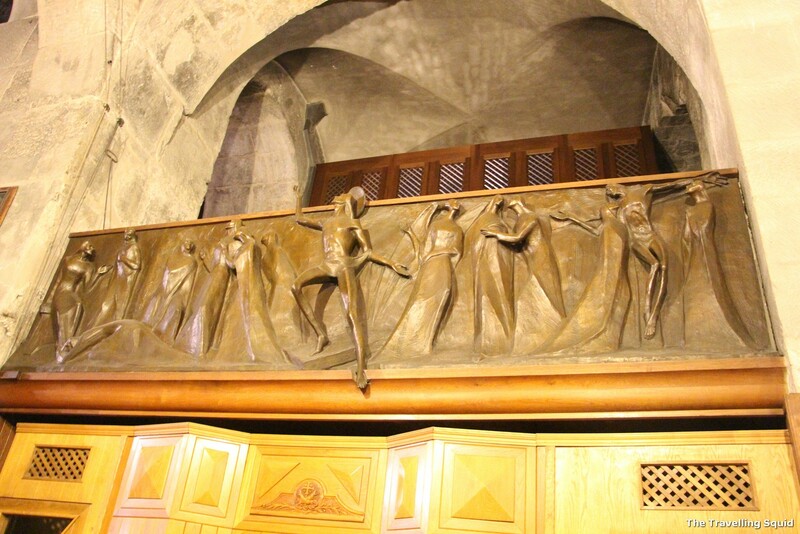 Near the closing time, the church attendants placed a hard stop on the number of people entering the chamber. When it was our turn, they told us to wait. The attendants went in and switched off the lights. The rest of the visitors had a really short time to simply sweep pass the small room, where you could barely stand upright. 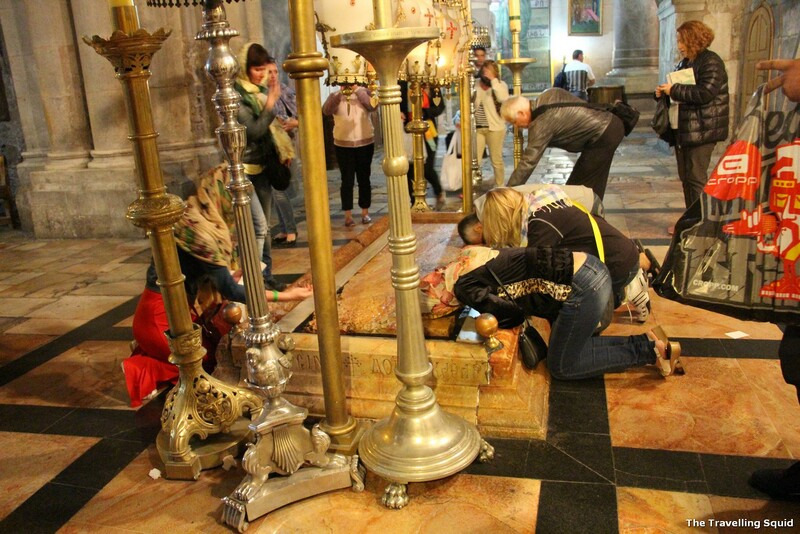 At several steps of the way through the church, there were instances in which we would see devotees kneeling on the ground, kissing the floor/ offering tray of the building. It was quite an intense sight to see, as these people were so passionate. Some even brought scarves and other home objects to be blessed at that particular offering place. I supposed to the devotees, it wasn’t just the tangible objects, but the hopes and wishes that they had brought with them. If these were tangible, they could fill up the entire church. 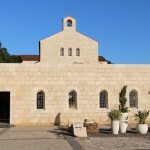 During the Sandeman’s tour, the tour guide said that maintenance of the church had stonewalled, given that it belonged to the three main groups – Armenian Christians, Catholics and Greek Orthordox Christians, if I remembered correctly. Because of the stonewall in discussions, any maintenance to the church had to be postponed. Today, a ladder and chair still remains in one of the balconies of the church. 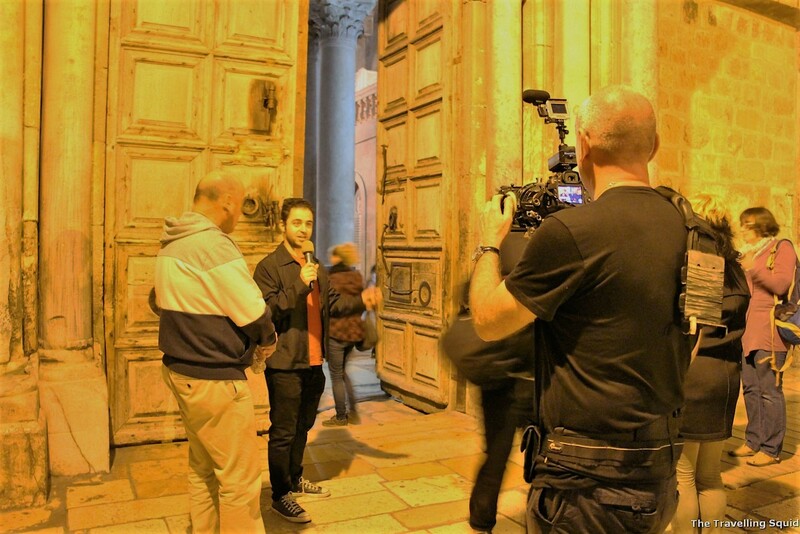 Filming right outside the Church of the Holy Sepulchre in Jerusalem. So who would be the holder of the key to this grand church? It would be a Muslim. We stayed until the end to watch the closing ceremony of the church, and was wondering if a man adorned with robes would be climbing on top that ladder. It turns out – it was a Muslim man, wearing a North Face jacket and jeans. If you’re in the vicinity and have some time to spare on your hands, you could stay to watch the closing ceremony, though it’s a tad underwhelming. 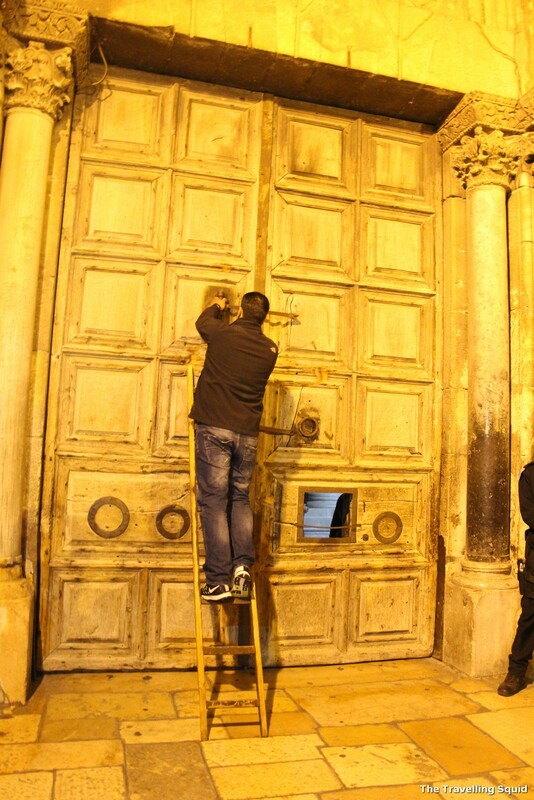 The doorkeeper, a Muslim who wears a North Face jacket would climb up the ladder to close the door. It’s really quite procedural. And the church is not quite closed. 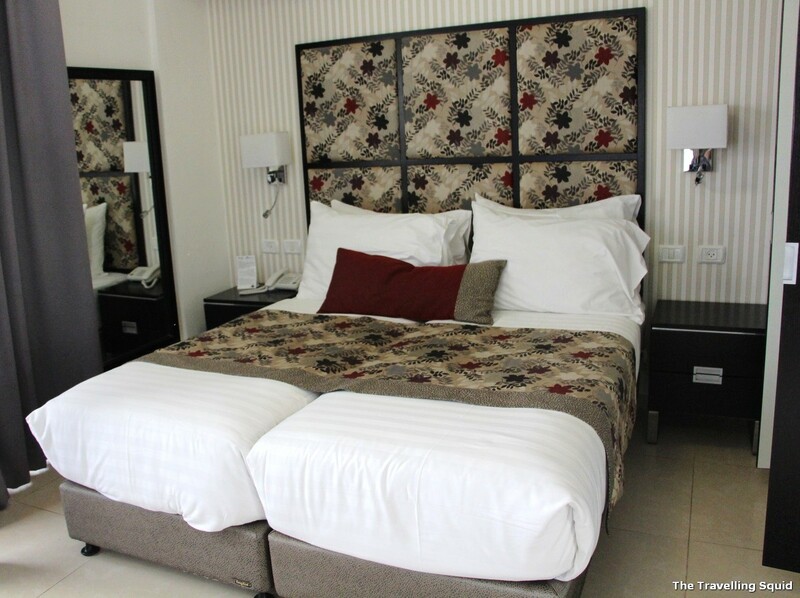 There is an option for people to sleep overnight at specific areas of the church. (Which is a little cold in my opinion). 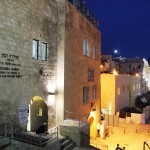 But for the religious, I can imagine that it would have been quite a peaceful and calm evening. 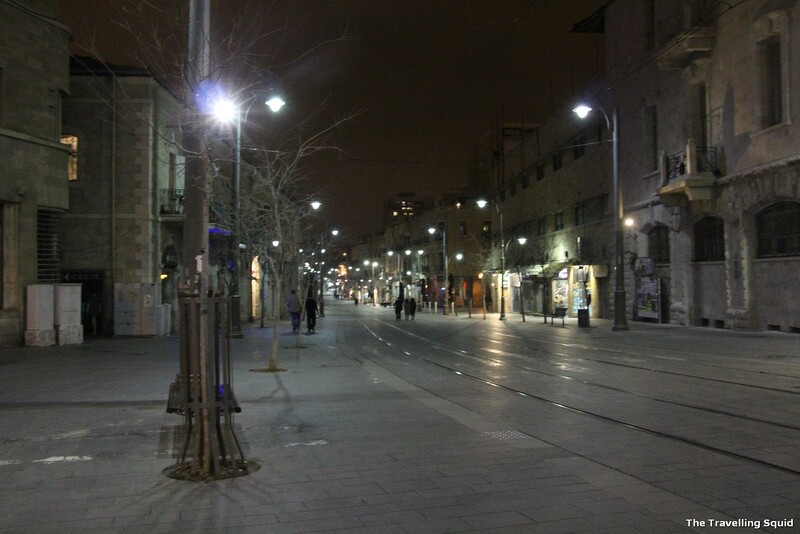 The streets are almost deserted when we left. 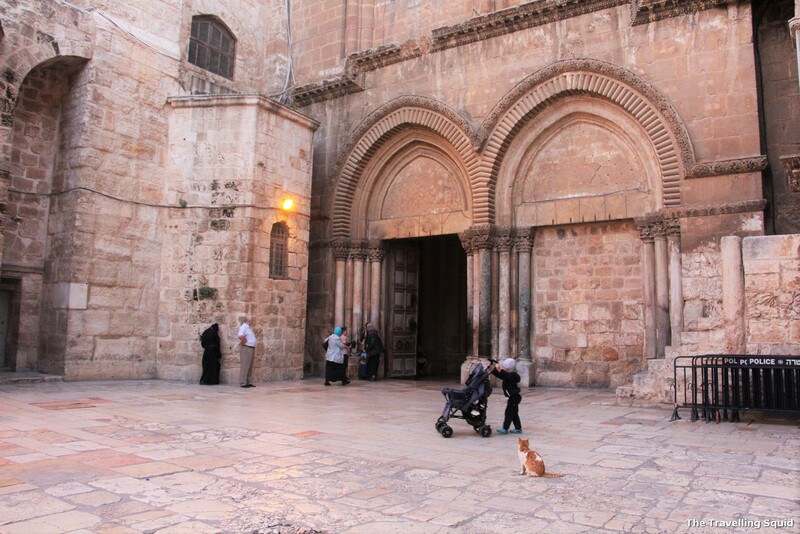 One Response to "Church of the Holy Sepulchre in Jerusalem – where hope resides"